One lucky East Cobber will win a TWO Tickets to Georgia Symphony Celebrity Luncheon on March 23, 12pm, at the Marietta Country Club. Plan to attend one of the most fun and engaging events on the East Cobb social calendar. 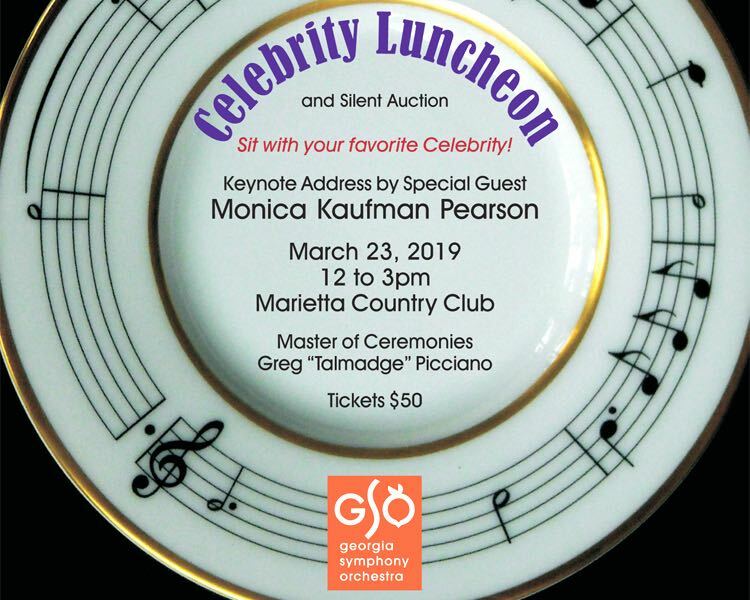 The Georgia Symphony Orchestra (GSO) is hosting its 12th annual Celebrity Luncheon fundraiser on March 23 at the Marietta Country Club. Monica Kaufman Pearson, renowned broadcast journalist and former longtime WSB-TV Channel 2 senior news anchor, will join a diverse and entertaining group of talented local artists, authors, musicians and business leaders as the event’s keynote speaker, which benefits the GSO’s musical performance, youth education and outreach programs. Not only are guests certain to be inspired by Pearson, as well as a few other surprises planned, they will select to be seated at a table with one of a carefully assembled collection of influential and creative people in the area to learn about their path to fame. A specially created three-course menu will be prepared by Gary Sanderson, Marietta Country Club executive chef, and his team. The luncheon also will provide a great opportunity for guests to indulge themselves from among an array of live and silent auction goodies, such as rare trinkets and tidbits, stunning fine art and everyday splurges. Founded in Marietta in 1951, the GSO, a nonprofit arts organization, has become one of Georgia’s finest community-supported, multifaceted performing arts organizations through imaginative programming, visionary leadership and critically acclaimed performances. Today, more than 700 individuals participate in one of its diverse programs, as musicians, vocalists, educators, students and volunteers. Proceeds from the event will allow the Georgia Symphony Orchestra to thrive and continue delivering classical, jazz and pops concerts of high-quality choral and instrumental music and help inspire and educate young musicians through the Georgia Youth Symphony Orchestra—the largest such program in the Southeast. Tickets are $50 and good seats still are available. To purchase, visit georgiasymphony.org. Go to http://www.facebook.com/eastcobber, and tell us your favorite dish from an East Cobb restaurant!